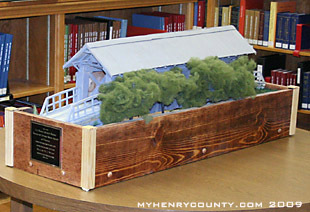 Marty Wyatt, an Indiana resident, builds models of covered bridges. And he donates them to historical groups across the country. 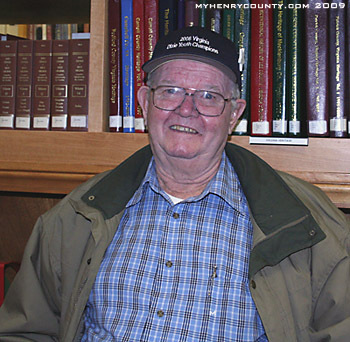 A replica of the Cut Bank Bridge was donated by Mr. Wyatt to the Bassett Historical Center January 7, 2009. The bridge is one of 3 known to exist in Henry County, VA. It was located about 3 miles from Spencer Virginia on State Road 695, the George Taylor Road, and spanned the North Mayo River. The Cut Bank Bridge was 63 feet long. 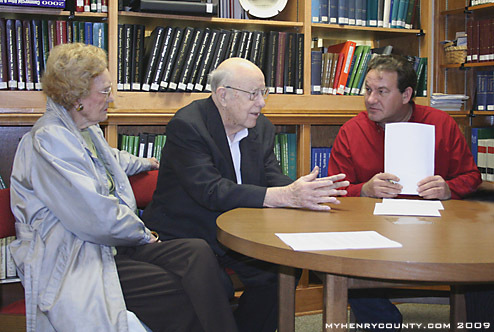 Bill Price, pictured in the center above with Mrs. Price and Marty Wyatt, remembers driving an oil truck full of kerosene over the bridge. Price said his biggest concern was keeping the truck on the "tracks" along the floor of the bridge. Since the bridges were built for lighter vehicles such as wagons they would rattle and let loose some cross boards when a heavier vehicle such as a car or truck went through. Long boards were laid lengthwise over the cross boards to form a track protecting the bridge floor. A second bridge was situated on the other side of Route 58 West in the Spencer area on Route 699. That bridge was build in 1901 and washed away in 1921. 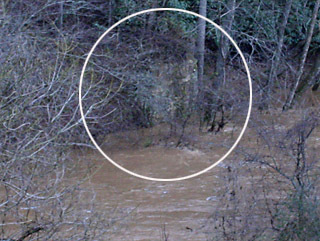 A third covered bridge was located just south of the city of Martinsville on present day route 220 and near the Smith River dam and powerplant. View a 1911 map of Henry County showing 'Cut Bank Road'. Stop by the Bassett Historical Center and view this latest addition to their extensive collection of Henry County treasures. One old stone abuttment on a high water day!